I am trying to apply a variable called “Answer” to a button, but I’m not having any success. Basically I’d like to hide a button when a SUBMIT button is visited (which displays an Answer layer). I tried setting up a True/False variable as well as a numeric one, but it’s just not working. Any ideas? TIA! 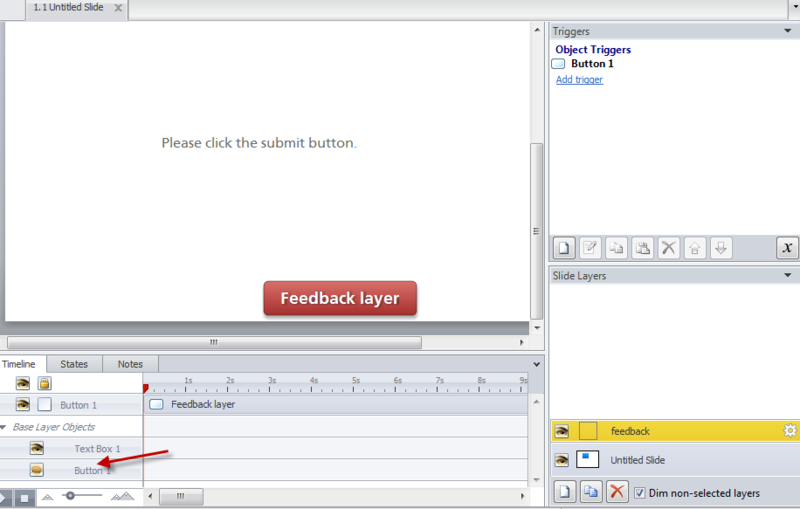 I built a slide that hides a button when the user clicks the submit button. Awesome! Thanks Dan! I didn't have the first trigger. 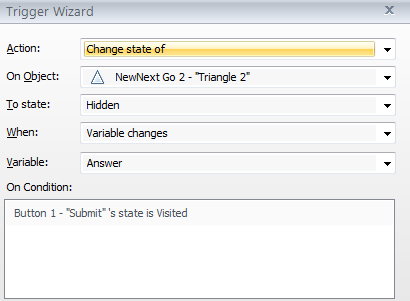 So my variable never knew what to do. But it's working now. I might me missing something here but wouldn't it be a lot simpler just to hide the base button on the Feedback layer timeline. This way you don't need any triggers. "I might me missing something here but wouldn't it be a lot simpler ..."
"Hi, Kate: I built a slide that hides a button when the user clicks ..."
Can you really reset a multiple choice question?